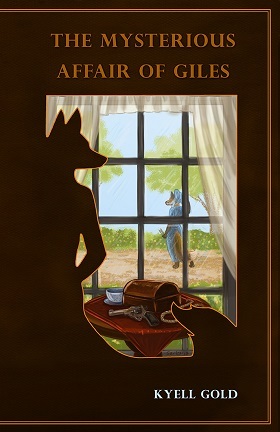 Kyell Gold already has the reputation of being the preeminent author of high-quality erotica in Furry fandom. Now it seems that he is trying to establish a similar reputation as furry fandom’s number one mystery author, at least of what is usually called the British “cozy” mysteries, or the country-house murder mysteries of which Agatha Christie was the acknowledged mistress. An acknowledgement thanks London furry fan Alice "Huskyteer" Dryden for “Brit-picking” the manuscript, making sure that it, and especially the dialogue, are correctly British. The furry characters are all English animals except where they are noted as coming from British India. Most tellingly, the title The Mysterious Affair of Giles is an obvious pastiche of Christie’s first novel, the 1920 The Mysterious Affair at Styles, which introduced both her as a mystery author and her most famous private detective, Hercule Poirot. Yet do not think that Gold’s novella is a point-by-point imitation. There is no Famous Detective in it. The year is 1951; not exactly the present, but not the old-fashioned past, either. Tremontaine is a large manor house a couple of hours’ drive from London. The cast is Mr. Giles St. Clair, an aristocrat but also an up-to-date industrialist, his wife, and their son and daughter in their early twenties, all red foxes, and Martin Trevayn, Giles’ business partner, a stoat, their guest at Tremontaine on a business visit, plus the manor staff, a deer senior housemaid, two weasel cooks, a rabbit and an Indian otter housemaid, an Indian brown rat butler and Mr. Giles’ dhole valet. Twelve characters. One of them is murdered. The principal investigators are a badger police Inspector and his wolf Sergeant. The mystery’s protagonist is Ellie Stone, the young weasel assistant cook, a reader of murder-mystery novels who has never wanted to live in a real one, but who can’t help comparing the actual police’s sleuthing with her fictional police’s detecting. Naturally, everyone has a secret, and during the course of the story they all come out. Some are pertinent; others are not. Kyell Gold’s stories often come with “Adults Only” readers’ advisories. The Mysterious Affair of Giles does not need one – quite – but its cast are all adults, and some of the secrets revealed are adult ones. I do not recall Agatha Christie ever delving into this territory, but it feels natural here and it helps to keep the story from being a period-piece. Illustrations by Sara "Caribou" Miles,Dallas, TX, FurPlanet Publications, February 2014, trade paperback $9.95 (107 [+2] pages), Kindle $6.99. This story takes place on another world, among people who are not humans. The three peoplekinds live together in varied mixtures, with no history of war or racial strife. They work together and still have troubles to face. All three books have this preface. The three peoplekinds are the tall dragonlike korvi (they are called dragons because of the similarity, though they have feathers instead of scales), the small weasel-like ferrin (they can ride on their korvi friends’ shoulders), and the green-skinned insect/humanlike aemet (with prominent antennae) who have the talent of making plants grow. Further descriptions are brought out in the stories. Trade paperback $13.00 (5 + 439 pages), Kindle $2.99. Trade paperback $4.00 (91 pages), Kindle 99¢. Trade paperback $13.00 (703 pages), Kindle $2.99. We don’t look at a lot of board games around here (how anthropomorphic can you get with them, really? ), but now and then something catches our interest. One such thing is Sewer Pirats. It’s a new 4-player board game created by Andreas Pelikan, with artwork by Marina Fahrenbach, and published by Heidelberger Spieleverlag (whew!). Here’s how they describe it: “In Sewer Pirats, deep underground in a maze of domed caverns, narrow tunnels, and piped passages, a motley cast of rodents, insects, and other vermin sail the treacherous waters of human refuse aboard bizarre vessels in search of discarded booty. 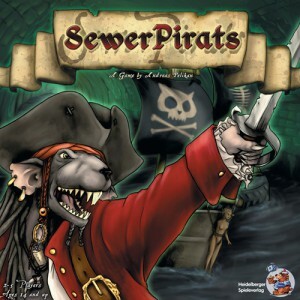 In order to claim the best haul from the abandoned flotsam, players must make careful use of the unique abilities of their crews’ rats, cockroaches, weasels, and other critters. Don’t settle for less than left-over fast food and dumped toys. Go for your goal to become a true legend among the sewer pirates.” Apparently out for a while now in Europe, the game has only recently become available in North America. Check it out at Board Game Geek. Shut Up Cartoons is a YouTube channel of original animated series put together by the Smosh Channel, which claims to be the third largest Channel on YouTube. In amongst titles like Oishi High School Battle and Zombies vs. Ninja are a couple of shows that furry fans might want to take notice of. Krogzilla is one of the newest. “Born as an unknown mutation of aquatic lizard, Krogzilla was a 200-foot tall fire-breathing sea monster that terrorized coastal cities all over the world, until a team of scientists defeated him by shrinking. Now reduced to only six feet in height, Krogzilla has to figure out how to become a functioning member of society. 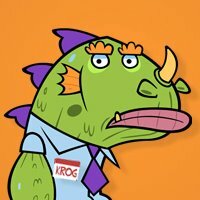 First thing Krog needs to do is find a job”. The series updates every Thursday, and you can find it on YouTube here. While you’re there you might also want to check out the preview trailer for Weasel Town, which premiers next week. 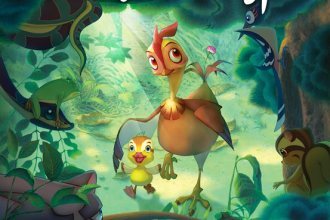 If you've been paying attention to the Recommended Anthropomorphics List, you might have noticed a movie called Leafie: A Hen into the Wild. Otherwise, you have probably never heard of it, unless you are one of Flayrah’s South Korean readers. When I first saw Leafie's trailer, I was impressed with the animation and character design, and wondered how the movie would hold up. I was finally able to see the movie, and it is certainly one that furries should seek out. Nature's Guard is an animated series created by myself, Jonathan Bryans -- I thank you for the announcement on your site -- Just to let you know, I have signed Jeremy Bulloch (Boba Fett), Warwick Davis (Wicket the Ewok, Willow) to the project to do voices -- also, Peter Mayhew (Chewbacca) is coming on and we are talking with Mark Hamill's (Luke Skywalker) agent to bring him on -- I will continue to forward you information as it comes out. We also have a 3 issue comic book mini-series coming out, starting in February of 2002 from Warpton Comics in the UK. British author Garry Kilworth's 1997-1999 talking-animal trilogy "The Welkin Weasels" (v.1, Thunder Oak; v.2, Castle Storm; and v.3, Windjammer Run) has proven popular enough that Kilworth is adding a second trilogy to the series. It has just started with v.4, Gaslight Geezers. If the first trilogy can be summarized as "Robin Hood with weasel good-guy outlaws fighting stoat nobility", the new trilogy is "Sherlock Holmes with weasels". Very witty. This is a British series with no American edition, so those interested should look for it at Amazon.co.uk. The specific page with cover illustration is: http://www.amazon.co.uk/exec/obidos/ASIN/0552547042/.